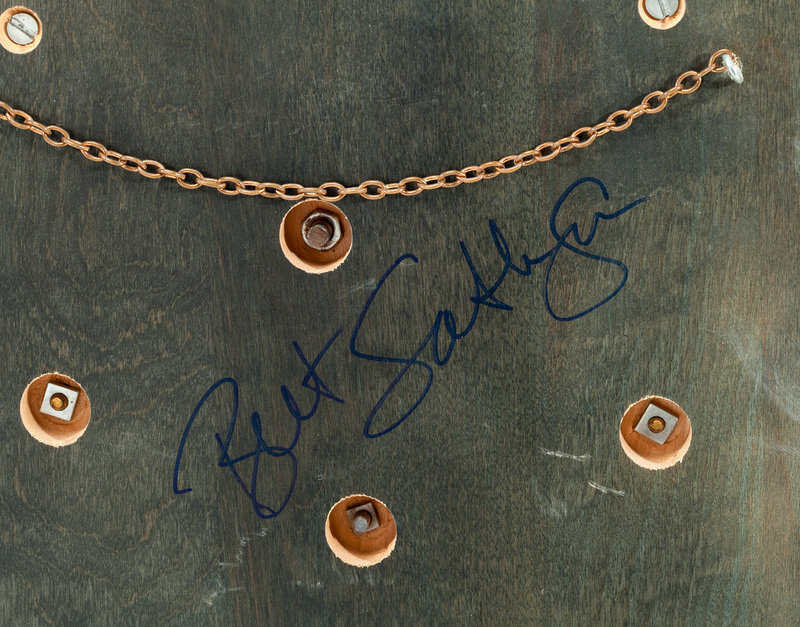 In just his second big league season, Bret Saberhagen rocked the baseball world in 1985, going 20-6 with an ERA of 2.87 and helping to lead the Kansas City Royals to the club’s first World Series title in their history. This iconic Balfour-designed award consists of a visually striking, silver-plated design mounted on a black lacquered wooden plaque measuring 13 1/2-by-16 inches. 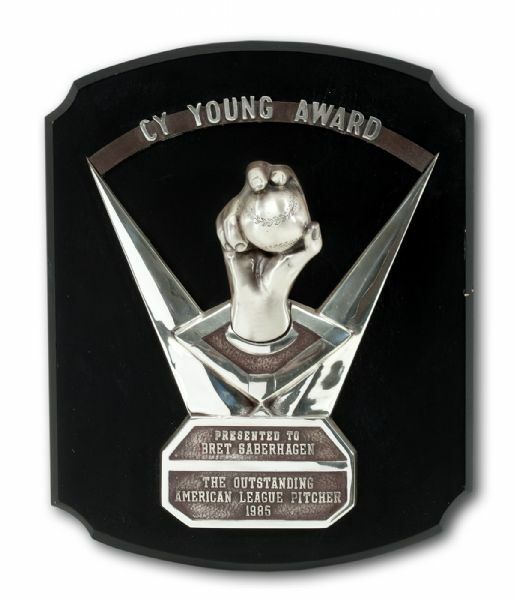 The centerpiece of the near 11-pound award is a lifelike sculpted pitcher’s hand sprouting from the mound of a baseball diamond and clutching a ball with a two-fingered grip. Relief lettering above and below reads, “CY YOUNG AWARD” and “PRESENTED TO BRET SABERHAGEN - THE OUTSTANDING AMERICAN LEAGUE PITCHER 1985.” The design elements and the plaque backing are extremely well preserved and highly presentable; there are only a couple of tiny scratches the right side of the black wood board and little or no scuffing on the edges of the board. Saberhagen has signed in bold blue Sharpie on the back of the plaque. 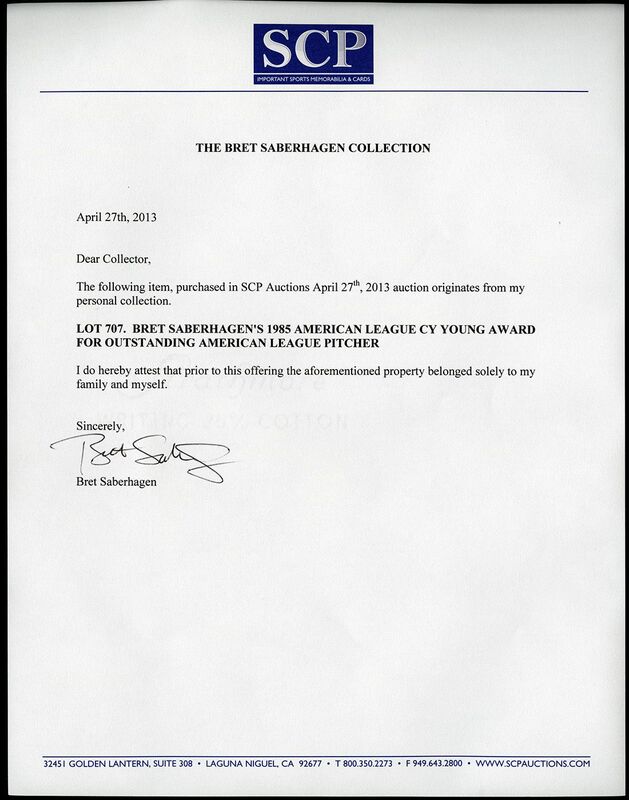 This is a rare opportunity to acquire one of the elite individual baseball awards of the modern-era. Comes with a LOA from Bret Saberhagen.